There have been numerous people doing the More Homework Meme and a few folks have tagged me. However, I am complying with the homework that my Twitter Best Friend For Life, Lyn Hilt, assigned me, as she was the first to tag me. I think it is a great way to get to know our fellow bloggers/tweeters, so here it goes. For starters, here are 11 random facts about me many people may not know. 1. 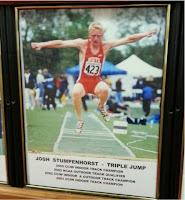 I was a collegiate triple jumper at North Central College and won 3 indoor and 2 outdoor conference titles in that event as well as finished 9th in the country as a junior. 2. When in high school, I worked on a dairy farm where I milked cows twice daily as well as other odd jobs on the farm. 3. When I was 10 years old, my younger brother and I ran away from home. We returned about an hour later. 4. I am constantly terrified about parenting my two boys. 5. For the past 708 days (and counting) I have not missed a single day of running. 6. When in college it would not be uncommon for me to sit and play video games for 5-7 hours at a time. 7. I was a sports reporter for my small local paper when I was in high school. I wrote under a pen name because I was playing in some of the events that I covered. The coaches always found it interesting that the reporter was aware of half time speeches and such because they didn’t know it was me. 8. I hate berries…all of them. 9. I am an Eagle Scout. 10. I have never watched a single episode of Lost but have seen every episode of Seinfeld more times than I can count. 11. When I was young (don’t quite recall the age) I flunked swim lessons and to this day am petrified of being in deep water. Here are Lyn’s questions and my attempts to answer them the best I could. 1. Do you have a middle name? If so, what is it? Anything special about it? My middle name is Daniel and it is a family tradition as my father’s name is Daniel. 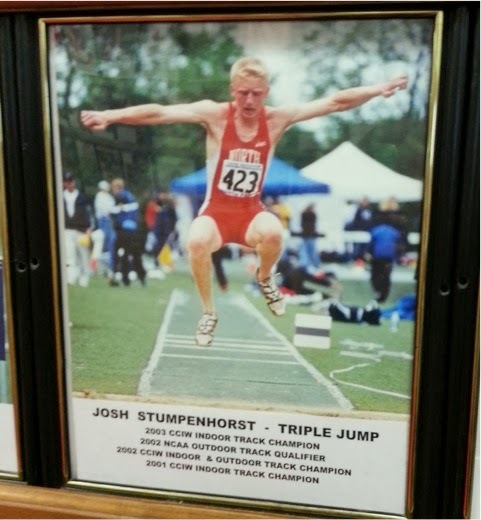 My oldest son’s middle name is Joshua. Funny you should ask that. J I actually have one blue and one green eye. It is always a fun conversation starter. 3. Where would you go in a time travel machine? Would you stay? As a history teacher, I am not sure I can really just pick one time period to visit. If I had to pick one, I would say that being in Egypt as the Great Pyramids were being built would be pretty amazing. It would be so valuable to see how the aliens really came down and built those for the Egyptians. Yet, I would not want to stick around. 4. Who is the person you most trust in the world? Without a doubt the person I trust the most in the world would be my wife Christie. 5. What high school activities did you participate in? In high school I played basketball all four years and baseball for one. For clubs, I worked with student council and yearbook. Hard to believe but I also had some minor roles in our school productions of Guys and Dolls as well as Grease. No, there are no known videos of those floating around. 6. If Twitter ceased to exist tomorrow, what would you most miss about it? I would miss the people and the conversations I have at any given time. I greatly value the people I have met and the relationships I have formed. That and I would miss knowing when Dean is taking a nap. 7. Seriously, what do you think of the Miley Cyrus song, Wrecking Ball? Not a fan but as soon as Steve Anderson does it for karaoke I will probably like it. 8. Do you cook or bake? What is your specialty? I will occasionally cook and make a mean Chicken Parmesan. In all seriousness, I am not sure if I should really admit out loud the answer to this question. When I was a young adolescent, I was a big fan of the New Kids on the Block. Yes, you read that correctly. One year for Christmas, Santa brought me and my older brother tickets to go see their concert and I am man enough to admit I had a blast, sang along while wearing my NKOTB concert shirt and may still have a button from those boy band years. 10. Have you ever been “starstruck?” Explain. This was a tough question as I have been fortunate to meet some pretty amazing people in the past few years. I was surely starstruck when I was fortunate to meet some Chicago Cubs players as I threw out a first pitch at Wrigley Field. However, I would have to admit I was more starstruck when I met President Barrack Obama in the White House last year. It was a bit overwhelming and a moment I will never forget. 11. How far away from your birthplace do you live now? I currently live about ten minutes away from the hospital where I was born. 1. What was your favorite children’s book as a child or favorite to read as a parent? 2. If you had won that insane lottery jackpot, what is the first thing you would buy? 3. Can you touch your tongue to your nose? 4. If I were to meet you up at a bar, what drink would I buy for you? 5. When was the last time you laughed so hard it hurt, and what was it that made that happen? 6. What is that one movie that shows up on TV that even though you have seen it a hundred times you still leave it on and watch? 7. If you could sit down and interview one person, living or dead, who would it be? 9. What is something you have always wanted to do but continue to procrastinate and make excuses as to why you have not done it yet? 10. Have you been able to unlock the code and figure out what a fox says? 11. If you could pack it all up today and move, where would you land?